Princess & the Paper presented by A Jillian Vance Design: Ranger Friends! Hey everybody! 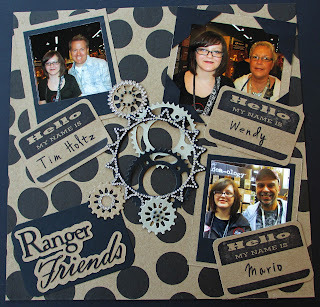 Today I've got another scrapbook page from California- this time it's with my friends from Ranger- Tim Holtz, Mario Rossi, and Wendy Vecchi! They are so nice and I got the pleasure to meet them at both summer CHA 2011 and Winter CHA 2012! Right now, I'm listening to Parachute (A fabulous band!) and writing my post- lets get started! Love this layout. The nametags are such a great idea for this!